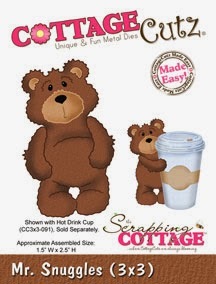 Hello everyone, today I am sharing CottageCutz Mr. Snuggles, he is absolutely DARLING!!! I just love this little bear! Mr. Snuggles is cut with white card stock and colored with copics. 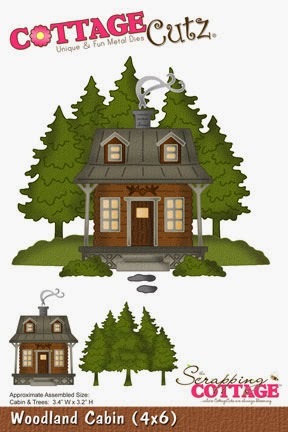 Next all the Woodland Pine tree's were cut with a green from AC Card stock "Earth Tones" pack. I then distressed them with a distressed ink in green. My design paper is also AC, and was sewn with brown thread. Next I added some seam binding in blue and brown to create a big bow! The HUGS is a brad, i just cut the shank off the back and glued it on. I love the colors on this card, withe the darling Mr. Snuggles and all the Woodland Tree's. 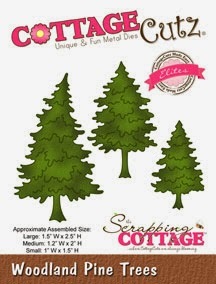 To view all CottageCutz dies released for Black Friday, please visit here! they are absolutely DARLING too! Absolutely beautiful, Cheryl! Mr. Snuggles is so adorable and my favorite too from the Black Friday Release. I love the colors! this is just all wrapped up in adorable!! way too cute :) love the colors too!! iii, so cute. This bear is really darling and card is beautiful. So cute!!!! Happy New Year!!!!! Oh my gosh this is so cute Cheryl. You know I love that sweet little bear. Your cards always melt my heart. Just beautiful.